I have never made a purchase from Old Navy. I tend to like my clothes a little edgier, but I was reading Chubble Bubble’s Poolside Musts and several Old Navy bathing suits showed up in the link she gave for Plus Size One Piece Swimsuits, so I decided to check them out. 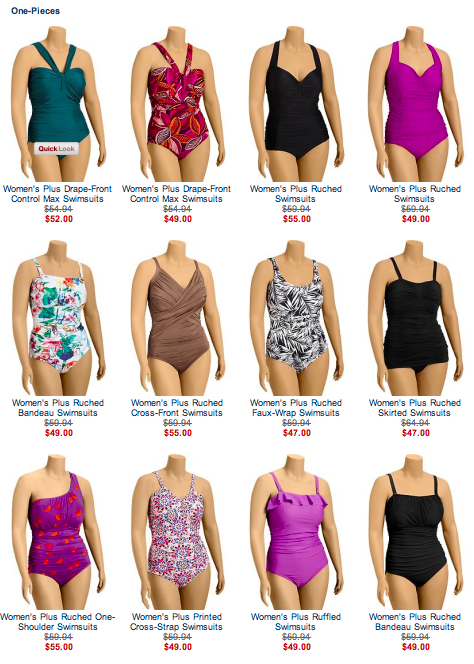 I was able to select the bathing suits by size on the Old Navy website, so all of the suits shown above are Size 4X, but there seemed to be a lot of variance in how they fit. The magenta suit at the end of the top row, which I liked a lot, was consistently was reviewed as too small. But the lighter magenta/violet suit, with the ruffle top, was reviewed as very true to size, so I think I am going to give that a try. This redish purple is my favorite, matches my glasses, and is difficult to find. The original price was $59, now marked down to $49, free shipping does not apply because it is not more than $50 but they do have free returns. I will let you know how it fits, especially since Old Navy is new to me. You may may notice that I am more cost conscious than I have been in the past. Now that we have retired I am more interested in what things cost, since I have a more limited income. So if you see a great bargain, let me know and I will post it here or on my Facebook Page.